Most of my clients are not immediately concerned with their current credit rating. They have far more pressing issues, like keeping a roof over their heads, keeping their cars from being repossessed or sold at a sheriff”s sale or avoiding having their wages garnished by a judgment creditor. In fact, when people in my office ask if bankruptcy will “kill their credit” my initial reaction is often to tell them that if they are still worried about their credit rating, maybe bankruptcy isn’t the answer. But that is really just a knee-jerk reaction. The real issue is will my clients have a chance to obtain credit again in the future; will they qualify for a mortgage or buy a car with a decent interest rate. The answer to that question is certain. Bankruptcy, in the short term, will not help your credit score. However, over time, most debtors will find that the bankruptcy will result in a net positive, as long as they do the right things to obtain credit, and use it wisely and responsibly. Naturally, not everything is rosy, and it is unquestionable that a Chapter 7 bankruptcy will remain as a mark on your credit report for up to 10 years after the bankruptcy. A Chapter 13 case will remain on your credit report for up to 7 years after filing your case is complete. However, there are immediate positives. First, assuming your income hasn’t changed, your debt to income ratio will immediately be set back to a realistic number. While this does not directly effect your FICO credit score, it does impact your overall credit worthiness. 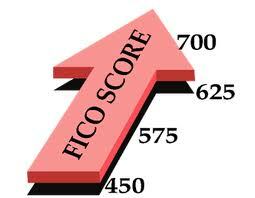 The real bottom line with regard to your credit score is that you will be starting, for the most part, from scratch. You will need time, patience and above all, serious discipline. In the end, however, rebuilding your credit score, and overall credit worthiness is something that you absolutely can do long before the bankruptcy “falls off” your credit report. Start with a Secured Credit Card. Shortly after receiving your discharge order, you should begin the process of rebuilding your credit. I advise all of my clients to start small, with a low available balance credit card. I typically advise people to get a secured credit card, rather than applying for an unsecured credit card right away. The reason is I want the recent bankruptcy debtor to be dead certain that they will get the credit, and avoid unnecessary credit checks — more than one of which will generally LOWER your credit score, regardless of whether you are starting fresh or have great credit. A secured card is one that is attached to a deposit account. The trick here is that this is NOT a debit card. You need to leave the balance alone, and pay your bill when you get it each and every month. If you fail to pay — or default — the bank will sweep your account to pay the amount due to them. Worse, you will destroy the very credit score (and credit worthiness) you are attempting to rebuild. A secured credit card can be found at many national banks, local banks and from credit unions. They are not, however, highly advertised. Do your research. Find one that does not have high start up fees or high annual fees. Use it wisely. Use the card 1-3 times a month, and keep the charges down. By no means should you use more than 30% of your credit limit in any month (and preferrably, keep it to under 10%) and be sure that you can pay the balance off IN FULL each and every month. So, if you have opened a secured credit card with a $500.00 deposit, you will typically have a $500.00 credit limit. Treat the limit as if it were $150.00 (and to be safe, pretend its $50.00) and pay it off in full every single month. Your credit score is impacted fairly heavily by your credit utilization. Use too much of your available credit (even if you are paying it off at the end of the month) and your credit score will suffer. You will want to be discussing the possibility of moving your credit limit up, and preferably moving it to an unsecured credit card, as soon as possible. One card is a starting place. Once you have begun to establish a new credit history, you will need additional cards to continue to build your credit score. It is good if you can have three cards, in total. Retail cards — such as a store card or a gas card are a good place to start, because they typically are easy to get. I recommend at least one of the additional two cards be a gas card. Why a gas card? Because you need gas for your car on a regular basis, and because you are not likely to be tempted to make large purchases or make a lot of impulse purchases at the pump. Again, keep the charges down to no more than 30% (if possible 10%) of the limit, and pay the balance every month. If you do get a store card, get one from a store that doesn’t tempt you to buy too much. Its vital that you make certain that the cards you get report to all three credit reporting agencies. It is also vital that you pay your the balance in full each and every month. The next step I suggest is that recovering debtors get a small personal installment loan from their bank or credit union. When I say small, I mean $500-$1,000, with a relatively short term repayment. Remember, the purpose of this particular loan is not to use the money, but simply to rebuild credit worthiness and your credit score. That’s why I recommend putting the money in a separate bank account, with some additional money — for paying fees and interest associated with the loan. If the money is in a bank account that you do not use for anything other than paying the loan, you will be certain to have the available money to make each and every payment when it comes due. Perhaps the most important item on our list is to build a small savings cushion, so that when minor emergencies come up, you do not need to rely on building a credit balance. It is vital that you make all payments on time and in full (in the case of the installment loan, the full amount due each month, and in the case of the credit cards, the full balance each month). Having a small savings is an important piece of the puzzle to allow you to make the payments in full. Review Your Credit Reports Regularly. All along this process it is vital that you keep fairly close tabs on your credit report. I suggest that everyone check their credit reports to be sure that all debts show as discharged, and that the new credit you are establishing is being properly reported. The best way to check your credit reports (not your credit score just yet) is to visit the annualcreditreport.com every 4 months. You are allowed to get one each of the TransUnion, Equifax and Experian Credit Reports each year with no charge (Be sure to use annualcreditreport.com, to access the truly free reports). If you visit the annualcreditreport.com every 4 months and download ONE of the credit reports, you will never need to spend money to know what your creditors are saying about you. Verify the accuracy of each report and follow instructions for disputing anything that is incorrect. I also suggest spending a couple of dollars to check your credit score at myfico.com or directly with the credit reporting agencies about a year into your overall process. If you or someone you care about is struggling with debt, contact an experienced bankruptcy lawyer today. Call the Law Offices of James Wingfield at 508-797-0200, visit the contact page on our website or fill out the form below to schedule a consultation today.